Update 15/09/2014: introduced API changes from akka-streams 0.7. Update 30/10/2014: introduced API changes from akka-streams 0.9. Update 15/12/2014: introduced API changes from akka-streams 1.0-M1. 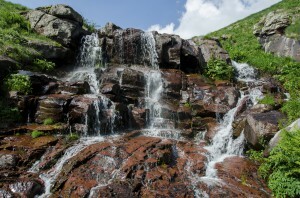 Reactive streams is a recently announced initiative to create a standard for asynchronous stream processing with built-in back-pressure, on the JVM. The working group is formed by companies such as Typesafe, Red Hat, Oracle, Netflix, and others. One of the early, experimental implementations is based on Akka. Preview version 0.3 includes actor publishers & subscribers, which opens up some new integration possibilities. To test the new technology, I implemented a very simple Reactive Message Queue. The code is at a PoC stage, lacks error handling and such, but if used properly – works ;). The queue is reactive, meaning that messages will be delivered to interested parties whenever there’s demand, without polling. Back-pressure is applied both when sending messages (so that senders do not overwhelm the broker), and when receiving messages (so that the broker sends only as much messages as the receivers can consume). ReceiveMessages(count) – signals that the sender (actor) would like to receive up to count messages. The count is cumulated with previously signalled demand. The queue implementation is a simplified version of what’s in ElasticMQ. After a message is received, if it is not deleted (acknowledged) within 10 seconds, it becomes available for receiving again. 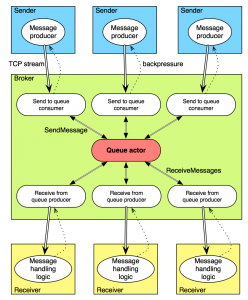 When an actor signals demand for messages (by sending ReceiveMessages to the queue actor), it should expect any number of ReceivedMessages(msgs) actor-messages replies, containing the received data. We can run any number of Senders and Receivers, but of course we should run only one Broker. There’s a different address for sending and receiving messages. Let’s look at the per-connection logic of the Sender first. We are creating a tick-flow source which produces a new message every second (very convenient for testing). Using the map stream transformer, we are creating a byte-frame with the message (more on that later). Having constructed a source, and a very simple sink (which just logs a message on stream completion), we define a complete flow: from the source, through the server’s flow, back to our sink. And we now have a reactive over-the-network stream of messages, meaning that messages will be sent only when the Broker can accept them. Otherwise back-pressure will be applied all the way up to the tick publisher. But that’s only a description of how our (very simple) stream should look like; it needs to be materialized using the run method, which will provide concrete implementations of the stream transformation nodes. Currently there’s only one FlowMaterializer, which – again unsurprisingly – uses Akka actors under the hood, to actually create the stream and the flow; the materializer instance is implicit in e.g. the run method call. On the other side of the network sits the Broker. Let’s see what happens when a message arrives. The connections returned by bind are a (reactive) Source: here we simply iterate over each connection, handling the incoming stream of bytes. We re-construct the String instances that were sent using our framing, and finally we direct that stream to a sink: the send-to-queue subscriber. To connect all the pieces together, we specify that the client-side flow (conn.flow) should be connected to our previously created sink; on the other side, we don’t send anything, so we just provide a never-completed, no-element source. The SendToQueueSubscriber is a per-connection bridge to the main queue actor. 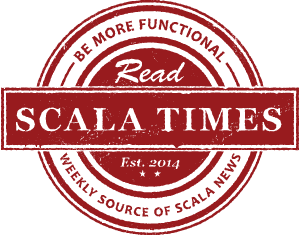 It uses the ActorSubscriber trait from Akka’s Reactive Streams implementation, to automatically manage the demand that should be signalled upstream. Using that trait we can create a reactive-stream-Subscriber[_], backed by an actor – so a fully customisable sink. What needs to be provided to an ActorSubscriber, is a way of measuring how many stream items are currently processed. Here, we are counting the number of messages that have been sent to the queue, but for which we have not yet received an id (so they are being processed by the queue). The subscriber receives new messages wrapped in the OnNext actor-message; so OnNext is sent to the actor by the stream, and SentMessage is sent in reply to a SendMessage by the queue actor. The receiving part is done in a similar way, though it requires some extra steps. First, if you take a look at the Receiver, you’ll see that we are reading bytes from the input stream, re-constructing messages from frames, and sending back the ids, hence acknowledging the message. In reality, we would run some message-processing-logic between receiving a message and sending back the id. On the Broker side, we create both a source and a sink for each connection. The source is a stream of messages sent to receivers, the sink is a stream of acknowledged message ids from the receivers, which are simply transformed to sending DeleteMessage actor-messages to the queue actor. As before, we need to connect all these pieces together: the source sends data via the client-side flow, to the sink. Similarly to the subscriber, we need a per-connection receiving bridge from the queue actor, to the stream. That’s implemented in ReceiveFromQueuePublisher. Here we are extending the ActorPublisher trait, which lets you fully control the process of actually creating the messages which go into the stream. In this actor, the Request actor-message is being sent by the stream, to signal demand. When there’s demand, we request messages from the queue. The queue will eventually respond with one or more ReceivedMessages actor-message (when there are any messages in the queue); as the number of messages will never exceed the signalled demand, we can safely call the ActorPublisher.onNext method, which sends the given items downstream. One small detail is that we need a custom framing protocol (thanks to Roland Kuhn for the clarification), as the TCP stream is just a stream of bytes, so we can get arbitrary fragments of the data, which need to be recombined later. Luckily implementing such a framing is quite simple – see the Framing class. Each frame consists of the size of the message, and the message itself. Using Reactive Streams and the Akka implementation it is very easy to create reactive applications with end-to-end back-pressure. The queue above, while missing a lot of features and proofing, won’t allow the Broker to be overloaded by the Senders, and on the other side the Receivers to be overloaded by the Broker. 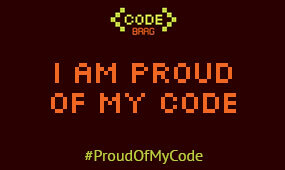 And all that, without the need to actually write any of the backpressure-handling code!